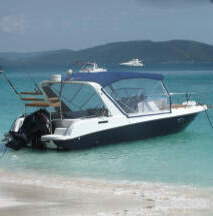 All Day Deep sea fishing in Pattaya archipelago. Pick up at 9am from your hotel/home and be dropped off at 5pm. Hummingbird and lowrance fish finders, gps chart plotter/sonar. Penn and diawa quality reels and rods. Very very competent captain. BBQ, Soft drinks, beers & 1 bottle of whiskey inc.
Spearfishing Trip Pattaya. Koh Khram, Koh Rin Islands and Koh Man Wichai. Pick up from your hotel/villa at 9.30 am. Spearfishing in pattaya is great fun. We only shoot what we eat and consider spearfishing the most environmentally friendly form of fishing as there is no by catch. Full tuition on safety and what to shoot and what not to shoot. Top quality Cannon triax, cressi-sub, beauchat and picasso spear guns. Mares masks, snorkels and fins. Weight belts. When we are tired we cruise off to a stunning deserted beach for our customery renouned BBQ and Dinks. Drop off to your hotel/villa at 5.30 am. Half night Deep sea fishing in Pattaya archipelago. Pick up from hotel/villa at 6pm and get dropped off at 3.30 am. 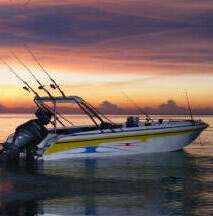 Night fishing is the best time to catch big fish in pattaya. The tranquility and the beauty of the water at night is pure bliss. The time passes very quickly as we are usually very busy onboard. We usually catch plenty of good fish between 1-10 kilo and a few bigger. Hummingbird and Lowrance fishfinders & a very very competent captain and first mate. Always a great night. Includes BBQ, beers,whiskey, soft drinks, snacks and your catch. On this trip we can virtually guarantee a good catch! All night Deep sea fishing. Only on large speedboat. Pickup from your hotel/villa at 6pm and drop off at 8. 30 am the following day. Fishing for the serious deep sea fisherman, on our band new speedboat. Hummingbird and lowrance fish finders, GPS chart plotter/sonar. Penn and diawa quality reels and rods. Very very competent captain. We usually catch plenty of good fish between 1-15 kilo and a few bigger. Includes our renound BBQ, soft drinks, beers and rum. 24 foot, marine plywood with 2 mil fiber coating, fish finder, GPS, music system, Yamaha four stroke outboard engine. Max 6 passengers. 29 foot walk around, fiberglass, cabin, toilet, 2 fresh water showers, kitchen, sink, fish finder, radar, GPS, electric anchor, trim tabs, music system and huge Suzuki four stoke outboard. Max 10 passengers. 43 foot fiberglass luxury motor yacht, large cabin/double bed, living room area, 2 flat screen TV's, music system, cooker, fridge, microwave, 2 sinks, 2 showers, fly bridge, large sundeck, huge Volvo Pentad inboard engine, electric anchor, GPS, fish finder, VHF radio and countless gadgets. 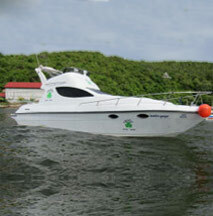 The boat is accompanied by a 6 person rib for easy beach access. Max 15 passengers.